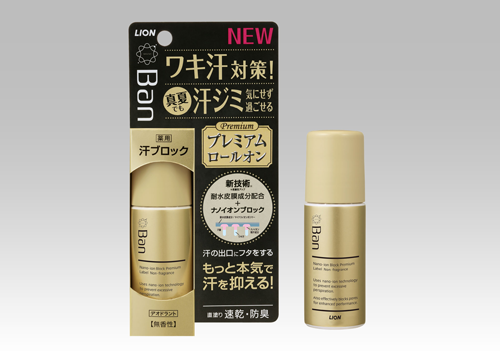 Lion Corporation (President: Itsuo Hama) announces the nationwide release of Ban Sweat-Blocking Roll-On Premium Label on February 10, 2016. This antiperspirant and deodorant is formulated with a new ingredient that forms a waterproof film and adheres more tightly to the skin. As higher numbers of women enter the Japanese workforce, stress-related perspiration in the underarm area among women has become more common. Moreover, as summer weather in Japan has become increasingly hot in recent years, many people often experience drenching perspiration during this season. These factors have prompted a rise in women’s awareness of the prevention of underarm sweat. According to a Lion survey, more than 80% of women express concern about sweat marks caused by their underarm sweat. Among these, one in three say that they are highly concerned. Reflecting this, a growing number of working women in their 20s to 30s are interested in the effectiveness of antiperspirants at blocking underarm sweat. In fact, 38% of women in this age bracket considered such effectiveness a key priority when purchasing these products in 2014, while 46% did so in 2015. In 2014, Lion released Ban Sweat-Blocking Roll-On, an antiperspirant and deodorant that blocks underarm sweat via a nano ion blocking effect before sweat emerges. Not only did the product garner favorable consumer reviews, the introduction of Ban Sweat-Blocking Roll-On has led to the creation of the new market category of underarm sweat solutions. Growing rapidly, the value of this new market during the period of January through November 2015 was approximately 243% of that in the same period of the previous year. Thus, this market category has served as a key contributor to overall growth of the market for roll-on antiperspirants and deodrants,1 the value of which in the said period was 112% of that of the previous year (Lion survey). To meet the resulting growth in demand, Lion will release Ban Sweat-Blocking Roll-On Premium Label, an antiperspirant and deodorant boasting superior sweat-blocking effectiveness that enables user comfort free from concerns about underarm sweat and sweat marks even at the height of summer. Along with a newly formulated negative ion polymer, nano ion antiperspirant ACH (aluminum chlorohydrate) adheres tightly to the skin. While ACH plugs sweat glands2 (the nano ion blocking effect), a new ingredient forms a waterproof film that coats the skin. Thanks to these actions, the product better stops underarm sweat before it emerges, thereby providing relief from concern about sweat marks and odor.